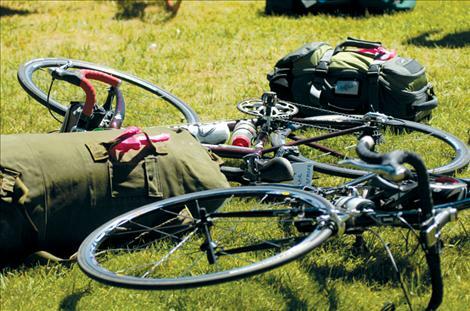 Bicycles, cycling gear, luggage and tents dot Boettcher Park on Sunday, Aug. 5 as a group of 300 bicyclists visit Polson on a tour of northwest Montana. POLSON — Bicyclists from Oregon, California, Utah, Washington, a few from Montana and other states, and even three men from France poured into Polson’s Boettcher Park on Sunday afternoon as they completed a 76-mile ride from Plains. The 300 cyclists are on a Bike Rides Northwest tour. The tour group from Bend, Ore., hauled the cyclists’ gear, provided food and beverages, showers at the campsites and rest stops every 25 miles. When the bikers reach their camping spot, they can even get a massage, for an extra fee. Sunnyside Sports, a bike shop from Bend, travels with the group and repairs bikes. Labor is free, but cyclists pay for the parts. Cameron Denney and Gary Hopson, a couple from Portland, Ore., enjoyed the ride from Plains. Hopson had a compliment for area motorists. “I’m very appreciative of the motorists; they’ve been very courteous to bicyclists,” he said. Denney was looking forward to a swim, but the Molly Trolley was available to ferry cyclists to downtown Polson for an ice cream social or a visit to the Glacier Brewery. Then the Port Polson Players put on a special performance of “Peach Pie Reunion” for the bikers. Cyclists put up their tents in Boettcher Park so they could relax and get a good night’s sleep. On Monday the group headed to Kalispell, then Tuesday to Eureka, Libby and Noxon, with the ride ending up back in Plains.